Making sure your children grow up healthy is a parent's number one priority. Help them receive the nutrients they need with U-Cubes by Solgar. 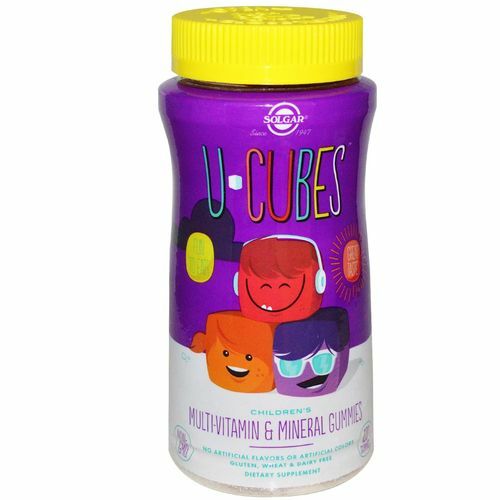 U-Cubes is an all natural multivitamin gummy that provides 15 essential vitamins and minerals (such as vitamins C and D) crucial to a childs overall development. This product is made without using artificial flavors and colors so you can be sure that the supplement you're giving your child is actually boosting their health and not bogging them down with filler. Take control of your child's overall health with with U-Cubes from Solgar. Order from eVitamins today and get the lowest price on the web! Warnings: This product contains fish (tuna and tilapia). Keep out of reach of children. If you are pregnant, nursing, taking any medications, including blood thinners, planning any medical or surgical procedure or have any medical condition, please consult your healthcare practitioner before taking any dietary supplement. Discontinue use and consult your healthcare practitioner if any adverse reactions occur. This product requires adult supervision and is not to be dispensed by children. Notes: This product contains no gluten, dairy or artificial flavor or preservatives. Recommended Use: Chew four gummies daily or as directed by a doctor.